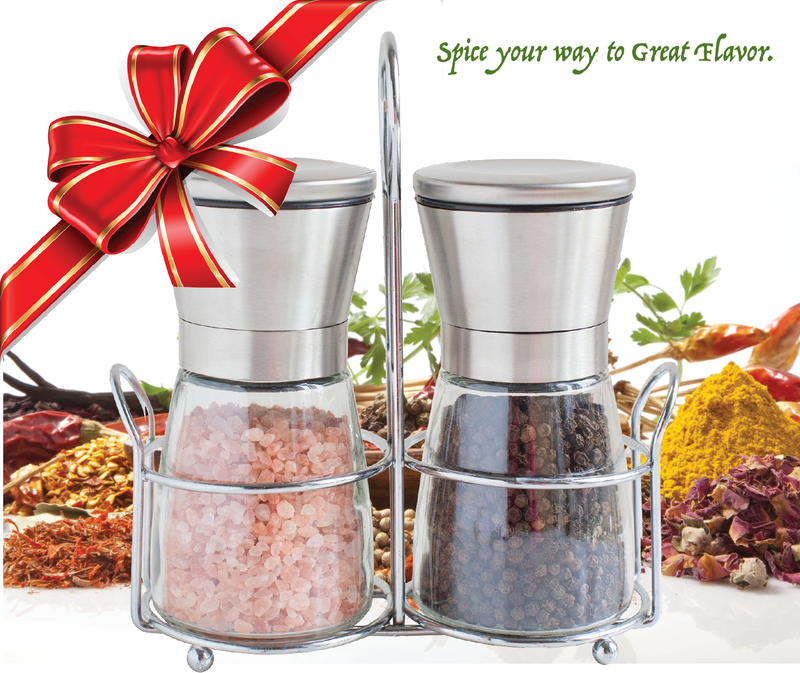 HIGH QUALITY GLASS AND STAINLESS STEEL GRINDER SET These salt and pepper shakers feature a modern design and are stylish and elegant enough for kitchen-to-table use! With 700+ 5 star reviews, you can buy with confidence. *Salt and pepper not included. BUILT FOR CONVENIENCE AND FUNCTION Unlike other spice grinder sets, this salt and peppermill pair have their grinding mechanism on the top of the grinder, ensuring salt and pepper ends up only on your food — not all over your table. 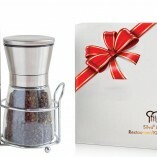 The ceramic grinder is non-corrosive and won’t absorb flavors, while a plastic knob on top of each salt and pepper mill allows you to easily adjust from a fine to coarse grind. EASY REFILLING WITH NO MESSES Don’t you hate constantly having to refill your salt and pepper grinders? Standing about 5 inches tall and holding 3/4 cup of spices, this set is the perfect size to cut down on constant refills without being bulky. When you do have to refill, the clear glass bodies will let you know when it’s time! The stainless steel top easily screws off revealing a wide opening for easy and mess free refills. 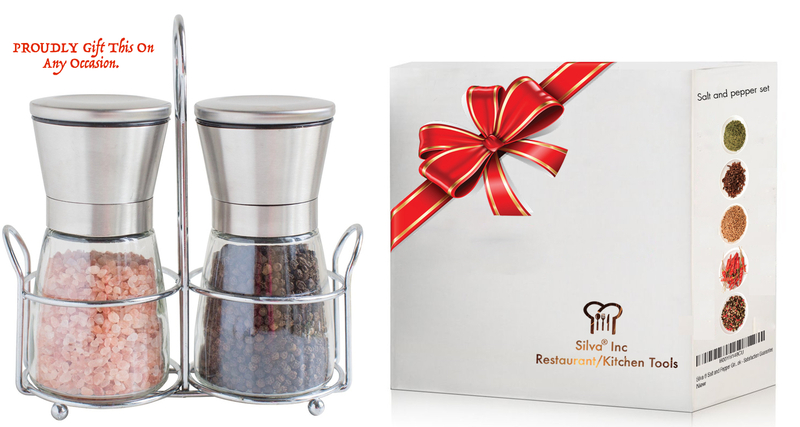 ELEGANT DESIGN With its brushed stainless steel encasing, glass body and ceramic grinder, this unique duo is a professional, sleek addition to any kitchen, with a stainless steel lid that truly “caps” off this beautiful set. No tacky electrical grinders here means no batteries required–only a few effortless twists with your hand to experience that fresh himalayan salt, pepper, or other spice. 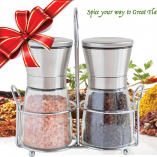 CUSTOMER GUARANTEE We’re confident you’ll love our Dual Refillable Salt & Pepper Shakers. However, if you’re not completely satisfied, we’ll give you a 100% refund within 90 days of purchase–NO QUESTIONS ASKED. We have the best customer service on Amazon, and YOU, the customer, are our top priority. Add a set to your shopping cart today for a risk-free culinary experience!